Orlando-based SeaWorld Parks & Entertainment filed plans Thursday to sell up to $100 million worth of public shares. The company would operate under a new name, SeaWorld Entertainment Inc., and trade under the symbol "SEAS." Private-equity giant Blackstone Group, which bought SeaWorld in late 2009 for approximately $2.5 billion, would retain a controlling stake in SeaWorld. The IPO comes as SeaWorld's finances continue to rebound from the global recession. Operating profit ballooned 34 percent to $229 million through the first nine months of this year, according to a regulatory filing with the U.S. Securities and Exchange Commission. Total revenue was up 7.6 percent to nearly $1.2 billion during the same period. The company's 11 U.S. parks drew 19.9 million people through Sept. 30, up 4.3 percent. SeaWorld said its parks have drawn more than 24 million visitors over the last full year period. The company says the gains have been driven in large part by its three SeaWorld marine parks in Orlando, San Diego and San Antonio and Busch Gardens Williamsburg in Virginia. A portion of the proceeds from the initial public offering would be used to make a one-time payment to Blackstone, which put down $975 million in cash when it bought SeaWorld from Anheuser-Busch InBev and financed the remainder with debt. The firm also took dividend payments totaling $610 million out of SeaWorld in 2010 and 2011, meaning it has already earned back more than two-thirds of its initial investment. Last edited by jedimaster1227 on Tue Feb 05, 2019 2:41 pm. Re: NEWS: SeaWold Parks & Entertainment goes Public! Pretty mixed feelings here. Once you have investors to cater to a lot of priorities tend to shift and the finer details take the back seat. If you worked at cedar point over the last ten years you know exactly what I mean. Any theories someone with good business knowledge can put out there to explain some reasons this is taking place? Why does every company have to go public? There are alot of companies that do just fine without it. I hope it works out. Rollercoaster Rider wrote: Why does every company have to go public? There are alot of companies that do just fine without it. I hope it works out. It starts with "M" and ends with "oney". Zingoman wrote: Pretty mixed feelings here. Once you have investors to cater to a lot of priorities tend to shift and the finer details take the back seat. If you worked at cedar point over the last ten years you know exactly what I mean. Kind of like how Comcast and Disney are spending record amounts of money on their parks because the theme park divisions are doing so well? It is simply business. Seaworld is offering stock to raise capital. What they do with that capital is up to the board. It maybe to pay Blackstone part of their investment back. More likely it would be money to fund business expenses. I'm pretty sure they will invest the money in the parks in the hopes to attract more attendance thus more revenue. Blackstone is in the business of entertainment, I don't see them dumping off their investment. The reason Disney decided to invest in the parks in these huge expansions because that is what you do during down economies. The interests in borrowing money are low, so you take advantage of the market and borrow as much money is needed to invest in your product. When the economy becomes better, people will come and spend money. And if you built something cool, millions upon millions of people will come. This is what Disney is doing. For me, that was the best reply of the year! Seriously, thanks for that made me LOL, and spit a little of my Hot Chocolate and Amaretto on the keyboard! 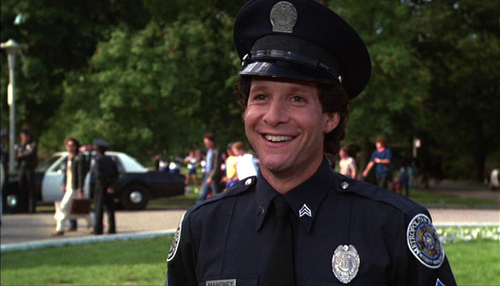 aka The best part of the Police Academy Franchise?